US buy-to-let property is not only big business for small investors; large investment funds have recently joined them in the bid to obtain yields from America’s buoyant rental market. The latest trend among the largest fund includes buying up new homes directly from the builder. 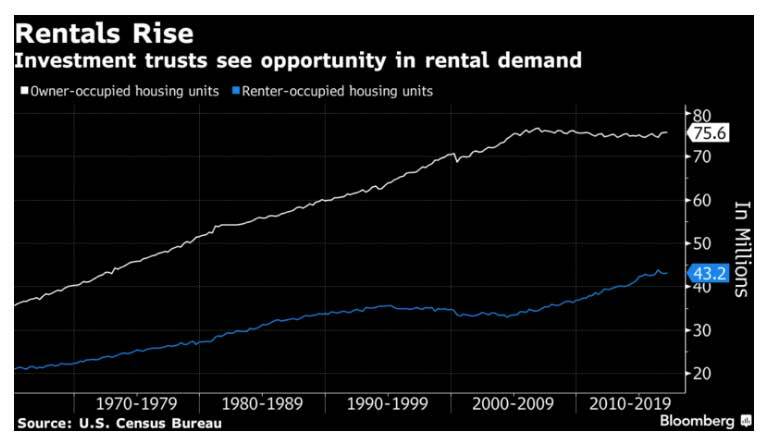 With homeownership in the US dropping to a near 51-year low, rental accommodation continues to represent a popular option for many households. Although the first quarter of 2017 saw the number of owner occupied homes rise ahead of rented homes, financial realities mean buying a property still remains out of reach for many families. Since the US property market crash, families have faced a number of obstacles in their way to becoming homeowners. One of the largest comes in the form of mortgage lending constraints including a larger down-payment in many cases. Rising house prices are another hurdle, despite the fact that in many metro areas, property prices have yet to surpass their 2007 peak. Millennials, one of the largest population groups in the US, face high student debt, which hinders their entry into the property market as buyers. Lifestyle changes among this generation such as delaying marriage and forming a family, have also made rental homes more attractive. “Renting a single-family home has become a more mainstream and viable option over the last seven years,” says John Burns, CEO of Burns Real Estate Consulting, quoted by Florida Realtors. As a result, the rental market remains buoyant and US buy-to-let property a popular investment option. Demand for property is strong and rental yields are steady. Despite a rise in the number of single-family rental properties in the market, the overall vacancy rate remains low. Less than 5% of US buy-to-let property owned by large investment funds is currently available for rental according to Burns. ATTOM Data found that the rental vacancy rate averaged 4% in the 473 counties in their study. The same research revealed that rental rates have steadied over the last year – they rose on average by 4.5% in the year to May. The fundamentals behind demand also remain strong. The US continues to create jobs – some of the areas currently creating more employment in the country are located in Florida with Tampa and Jacksonville at the head. Importantly for US buy-to-let property investment, job growth is solid in most top single-family rental markets, according to Burns Real Estate Consulting. Salaries are also increasing in these areas, which bodes well for steady rental yields. After the crisis, the main gateway into US buy-to-let property investment was via foreclosure homes. However, the drop in their number has led investors to look at alternative options. One of these is the so-called ‘build-to-rent’, currently experiencing something of a boom among America’s large real estate investment funds. Bloomberg reports a strong appetite among funds for new-build properties. One of the largest funds, American Homes 4 Rent, is said to be “buying lots and lots of houses in the US” and there’s big interest across the country. A favoured option is to approach builders directly and purchase off plan. Some developments have become exclusively rental – those with single-family homes offering onsite facilities such as sporting amenities and a pool are particularly popular – and some developments are entirely owned by investment funds. According to JWB Real Estate Capital based in Jacksonville in Florida, new-build US buy-to-let property makes a higher yield. Their research puts the return on a new single-family property at between 5 and 8% more than an older home.